Mar 6, 2019 • Alex P. Miller • A step-by-step guide to getting Jupyter up and running locally in the Linux container on your Chromebook. I was extremely excited when Google announced their plans to support Linux apps on ChromeOS. I immediateley updated my Pixelbook and started tinkering around. To my surprise, thanks to the modern magic of conda, getting my data science workflow up-and-running was fairly painless. 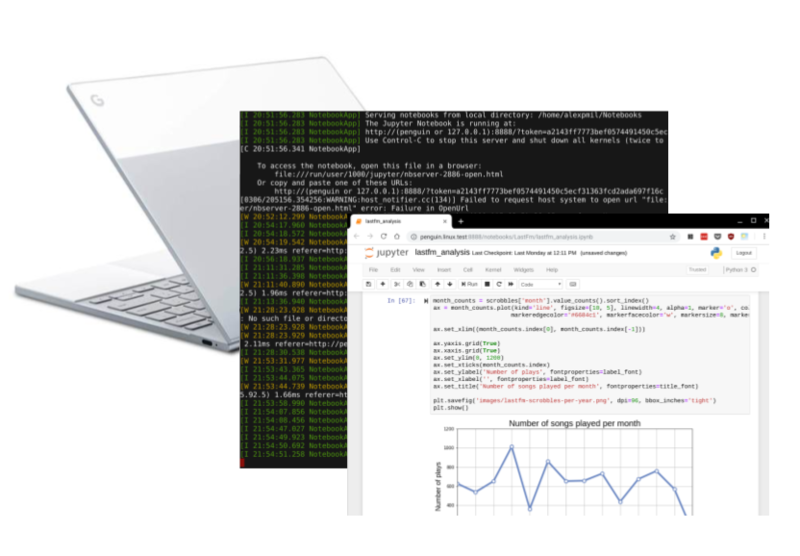 This post will guide you through the process of setting up Jupyter, Python, and (optionally) R to run in the Linux container on your Chromebook. I will be using conda in this tutorial, which is an environment manager that is a bit more comprehensive than pip. You can even install RStudio and other development tools quite easily with conda. I don’t have time to do a full explainer here, but make sure you’re familiar with the basics before proceeding: conda documentation. While it turns out you can do data science on a Chromebook, the question remains as to whether you should. I bought my Pixelbook hoping it would be a professional-grade device with superb reliability. Unfortunately, I’ve had many issues with bluetooth peripherals, external monitors, and WiFi connectivity. I’ve had to powerwash my Pixelbook twice in the last 6 months due to hardware issues. Indeed, the fact that I’ve had to setup my conda environment so many times is a reason I wanted to write this post in the first place! If you are a diligent about backing everything up, you never have anything to worry about (except lost time); but given how much of a pain it is to restore my entire development workflow everytime I have to powerwash, if I were to buy a new computer for the purposes of doing data science today, it would probably be a Macbook. Follow the prompts; at the end, your computer should automatically launch a new “Terminal” app, which you will now see in your app drawer (I always pin it to the dock right away). Using your browser, go to conda’s website at the following link and select which version of Python you want to go with your conda distribution by default: https://conda.io/miniconda.html. Since Python 2 is officially being sunset at the point, I recommend you choose the most up-to-date version of Python 3 for Linux 64-bit systems (for me, this is Python 3.7). Important! Once you’ve downloaded the installer, use the ChromeOS File Explorer to move the file (usually something like Miniconda3-latest-Linux-x86_64) into the “Linux Files” section of your device’s storage. Important! Different people will have different preferences about where exactly to install conda on their device; I’ve taken my cues from a couple of StackOverflow posts (here and here) on this topic, but know that this is by no means canonical. Type yes when prompted to initialize Miniconda3 in your /root/.bashrc folder. That should do it for your conda installation. Next, we just need to install Jupyter and you’ll be crunching numbers in no time. You can run R notebooks in Jupyter, and you can even run R in Python notebooks using rpy2 and the %%R magic (see here for more details). Note you may also need to install some Linux packages using apt-get to get this working properly. Look at any error codes you get when trying to run R; they usually tell you which packages are missing. 5. Launch Jupyter — do data science! Launch a notebook and start coding! Keep in mind, with this setup, you’ll want to install new Python packages using conda (e.g., conda install numpy matplotlib pandas).